Many geometrical features of manifolds and fibre bundles modelled on Fréchet spaces either cannot be defined or are difficult to handle directly. This is due to the inherent deficiencies of Fréchet spaces; for example, the lack of a general solvability theory for differential equations, the non-existence of a reasonable Lie group structure on the general linear group of a Fréchet space, and the non-existence of an exponential map in a Fréchet-Lie group. 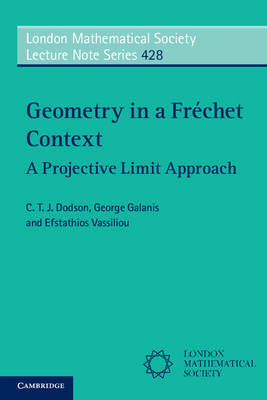 In this book, the authors describe in detail a new approach that overcomes many of these limitations by using projective limits of geometrical objects modelled on Banach spaces. It will appeal to researchers and graduate students from a variety of backgrounds with an interest in infinite-dimensional geometry. The book concludes with an appendix outlining potential applications and motivating future research.